In an interview with “Kappa,” the magazine insert of the Sunday edition of Kathimerini, Greece’s most prestigious newspaper, ACG president Dr David G. Horner explains the nature and history of the College, expresses hope that eventually Greece will allow fruitful exchanges between public and private institutions of higher education, and says that the country can outdo itself if it manages to enact meaningful reforms. Read the English translation below or click here for the original Greek. In 1979, at age 29, he became the youngest president of a US college or university in American history. With a PhD in education policy and administration from Stanford University, Dr. David G. Horner was appointed president of Barrington College and later of North Park University where, according to his resume, he tripled enrollment and enlarged the endowment. He arrived in Greece in 2008 to take over as president of The American College of Greece, which is considered the largest and oldest in Europe, but is not recognized in our country as a private university because of Article 16 of the constitution. 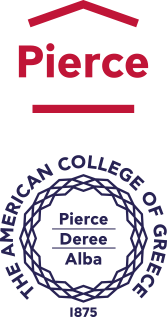 It comprises three divisions: PIERCE, DEREE and the ALBA Graduate Business School. In whose interest is it to have a non-profit American educational institution in Greece? The school was started in Smyrna, in 1875, by the United Church of Christ. President Obama studied in a UCC school in Hawaii! But when Smyrna was destroyed, the school moved to Athens at the invitation of Eleftherios Venizelos. Later, during the ‘60s, the school became independent of the church in order to continue to receive government funding. Today, [ACG] is run by a board of trustees whose ultimate responsibility is to hire and fire the president. So, now the US government is paying the bills? To a very small degree: approximately $150,000 per year or just about the cost of two Pentagon toilets. The US government supports us through the embassy, but not financially. No, not the CIA! Friends of the school. For example, DEREE was named after a Greek American from Chicago – whose Greek name was Derehanis – who made a large gift [to the school]. About EU30 million. Most of it is covered by tuition, and the rest from gifts and from our endowment. I must mention here that because of the crisis we have increased scholarships. At DEREE alone, we offer 1.8 million to more than 700 students. What advice would you give to the governing councils of Greek universities, who now operate more or less under a system like yours? I would not offer [them] any advice simply because our two worlds are completely cut off from each other. Unfortunately there is no relationship between the private and the public sector in Greece. The US higher education system is regarded as the best in the world. This system is based on a mixed model, where students can move freely from public to private and attend the programs that really interest them. Students pay tuition but they are supported by financial aid and government loans. Greece follows a monolithic approach where the state decides who and how many will attend which university. The problem is that in America the wealthy enjoy better education. To be sure: students from lower economic strata do not approach the top academic institutions despite financial aid. But the same is true of Greece. The system is radically backward-looking. Who has money for frontistiria or for good private schools that offer access to the better university schools? Obviously not the people at the bottom of the barrel. Those well-to-do people in Greece, who do not manage to enter Greek university will always find a place at DEREE, even with bad grades? The admission criteria at DEREE fluctuate with time. When I first arrived in 2008, the average was 13.8. Today it is 15.4. I believe we must become even more selective. Why should someone study at DEREE and not go directly to the United States? They should go! But tuition in America is three or four times more expensive than at DEREE, which, if you lifted it as is and transplanted it to the East Coast of the United States, it would be [an] eminently competitive [US college]. Proof of that is that we have had thousands of students who went on to the best universities in the US. Does the fact that there are no other private universities in Greece help you? No! Under normal circumstances, given what we offer [to students] there should be a 5-kilometers-long queue of Greek families knocking on our doors. We operate just like an American university on a magnificent campus in Athens. But people in Greece do not realize what a quality private institution can offer. How can you operate when private universities are forbidden in Greece? We were here before Article 16 was enacted. Once, at a conference at Stanford, I explained to them that some societies choose to outlaw drugs or prostitution; in Greece they have outlawed Stanford. But, really, is there space for private universities in Greece? I do not think that Harvard or Stanford will open branches in Athens. My theory is that allowing private universities will make public universities better. Now the system is insulated. There is no real choice for students nor is there any of the pressure of earning accreditation. As a result, [public] universities are not always oriented toward achieving their educational purpose alone. You mean strikes and takeovers? The environment at DEREE is very different, despite the fact that 10% of our students do parallel studies in Greek public universities. We have no partisan political activism. Is this because at Deree they are paying out of their own pocket? It is because they are here for different reasons – to learn. And I think they enjoy the different atmosphere. Have you seen Greece change during your tenure here? I saw laws about education change numerous times since 2008, sometimes for the better, some for the worse – the problem is you never know what awaits you around the corner. But I belong in the company of those who believe that this country can outdo itself and its size during our lifetime, if it manages to reform its structures as it is now trying to do. Will you remain longer in your position? I would like to. When I see a young girl who has done a semester at Stanford and an internship in New York, and all this with financial aid from DEREE – hey, I cannot ask for anything better as an educator. Will this girl find a job? No doubt about it! 70% of our graduates know what they are going to do. One last question: are Greek politicians – especially those from prominent political families – so smart that they are admitted to the best US universities? You mean before they become politicians? Yes! Are they so smart, or they use their family’s influence [to get in]? No! I think they are that smart. There are not that many strings left to pull to enter a US university.